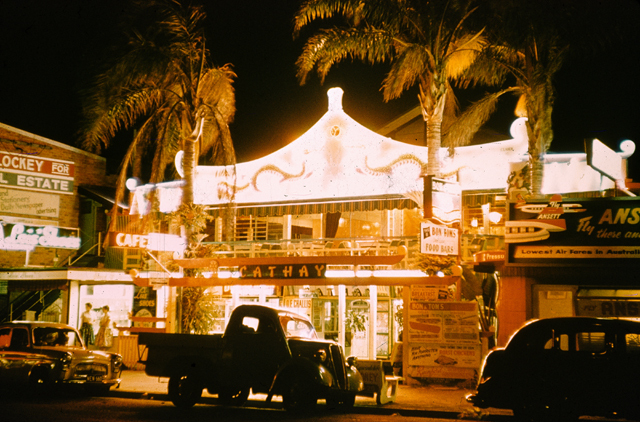 The façade of the Café Cathay included two large neon dragons and was the largest and most colourful neon sign in Queensland. 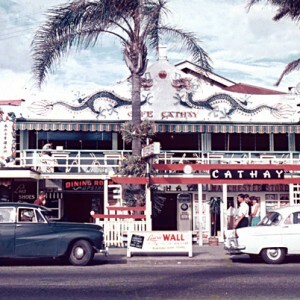 In early 1952 Tommy Wong Young, the owner of the Café Cathay in Fortitude Valley, Brisbane, spent £15,000 to purchase and transform a house at 3135 Gold Coast Highway in Surfers Paradise into the one of the first Chinese restaurants on the Gold Coast. The house had previously been owned by the Panitz family but, following its refurbishment, the only sign of the original house was the peak of the roof behind the façade of the new restaurant which was given the same name as its counterpart in Brisbane, the Café Cathay. 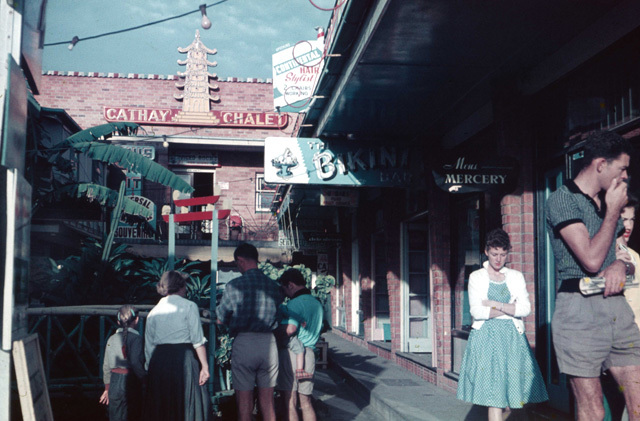 The year that the Café Cathay opened, Margaret Panitz held one of her two wedding receptions at the restaurant in the former family holiday home. Margaret’s reception was one of the earliest of countless celebrations held at the venue. 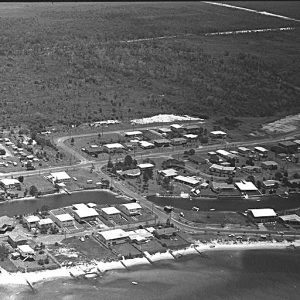 The newspapers of the time frequently reported various private parties being held in one of the restaurant’s rooms which were often followed by dancing at the nearby Surfers Paradise Hotel. 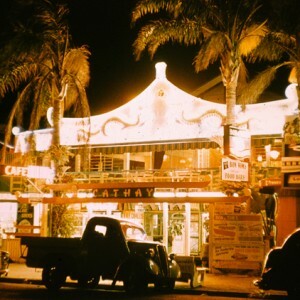 The façade of the Café Cathay featured two large neon dragons and was the largest and most colourful neon sign in Queensland during the period. 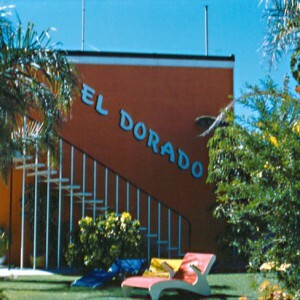 The colourful building with its large palm trees in front rapidly became a favourite photographic spot for tourists and appeared on numerous postcards. In 1953, Tommy and the syndicate he was part of, spent a further £40,000 purchasing the neighbouring site to build the Cathay Square and the Café Chalet. 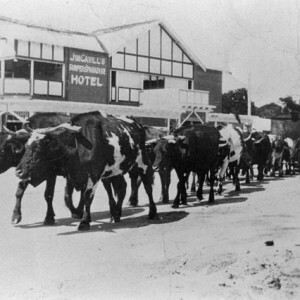 The new complex included a shopping arcade, gardens, water features and accommodation. Tommy was active in real estate development and also bought Paradise Island after the initial development as a market garden failed. 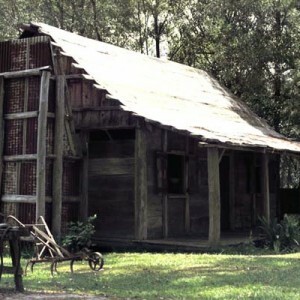 He was also part of the syndicate that owned La Ronde BBQ Restaurant. 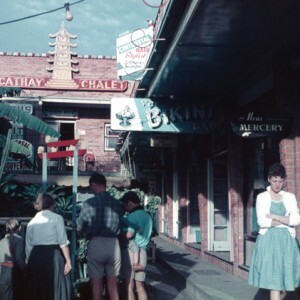 With Surfers Paradise becoming an increasingly popular destination for local and interstate visitors, the Café Cathay offered the first experience of Asian cuisine for many Australians throughout the 1950s and 1960s. Tommy died in 1965 and, in 1968-1969, the restaurant relocated around the corner to 57 Cavill Avenue. By 1970, it had undergone a name change and was known as Tien Loong Restaurant. 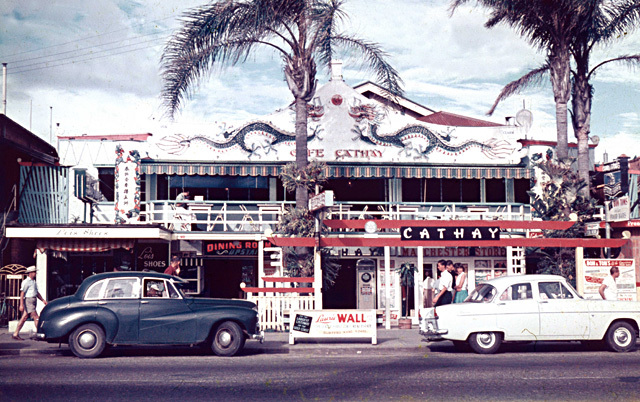 The Cathay complex was subsequently demolished and rebuilt as the Centre Arcade linking the Gold Coast Highway to Orchid Avenue. Gold Coast China Town, City of Gold Coast, 2013. Jenkins, Lesley. The perfect fit: multicultural entrepreneurs of the Gold Coast. 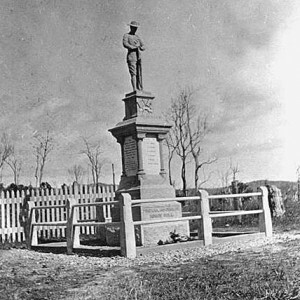 Gold Coast: City of Gold Coast Council, 2014.